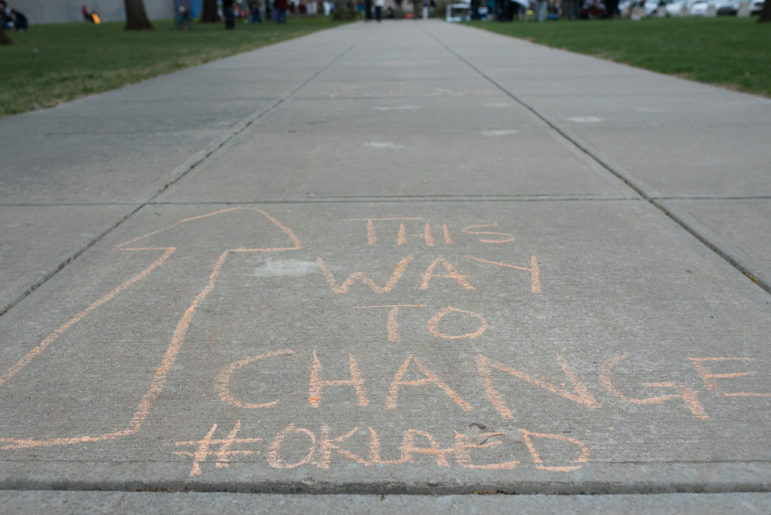 Chalk writing on the sidewalk at the Capitol on April 2 during a walkout aimed at increasing education funding. Perhaps the more controversial of the two is an effort to repeal the nearly $425 million tax package the Legislature passed to give teachers an average raise of $6,000. Ronda Vuillemont-Smith a co-founder of Oklahoma Taxpayers Unite!, a new tax-exempt social welfare organization backed by former U.S. Sen. Tom Coburn, said the group has drafted language to start a veto referendum that would repeal the funding legislation, which increased tax on fuel, cigarettes and oil and gas production. “We want to let those who pay have a say,” she said. Vuillemont-Smith said the group hopes to submit paperwork with the secretary of state in the next two weeks and, if given the go-ahead, begin collecting the needed 41,242 signatures to get the proposal on the ballot. She added that she believes repealing the tax hikes would not affect the teacher pay raises and create a nearly half-billion-dollar shortfall that lawmakers would have to address by finding money elsewhere, cutting spending or, as Vuillemont-Smith suggests, by finding and eliminating waste. But the potential ramifications appear to be more complicated, depending on how the proposal is written. House Bill 1023, the teacher-pay package that was signed into law just before the walkout began, includes language saying the act “shall be contingent upon the enactment of the provisions” of HB 1010. The attorney general’s office couldn’t confirm Friday whether approval of the referendum repealing the tax-hike package would simultaneously nullify the teacher pay bill. But educators say they believe that the veto referendum poses a direct threat to the raises. “(Oklahoma Taxpayers Unite!) is trying to repeal our efforts,” Oklahoma Education Association President Alicia Priest said during a press conference Thursday in which she implored educators to shift focus from the walkout to the elections. “We must defeat that effort. The other question is whether the tax increases in HB 1010 would be put on hold – again threatening the collection of revenue to pay for the raises – until the election if the anti-tax group gets the repeal question certified and obtains the required number of signatures. Both the Oklahoma State School Boards Association and the Oklahoma Policy Institute are among those who said they believe the state Constitution requires the tax increases to be put on hold until voters have their say. The attorney general’s office declined to weigh in since no ballot language has been submitted yet. Although Vuillemont-Smith questions whether her petition would stall the pay raises, she said she expects answers in the next few weeks. And with educators increasingly organized and active in state politics, she said she expects challenges to even get the proposal on the ballot. A second proposed state question, meanwhile, could give teachers a raise above what has already been approved. Restore Oklahoma Now drafted a ballot initiative months before the walkout. The group proposed to give teachers a $4,000 pay raise by increasing the gross production tax on oil and gas wells to 7 percent. But Mickey Thompson, executive director of Restore Oklahoma Now, said State Question 795 has been put on hold as organizers continue to discuss whether to proceed with the signature-collecting phase of the effort. Thompson said the debate centers around whether the plan enjoys enough public support now that the gross production tax is at 5 percent and teachers have received sizable raises. Then there’s the question of legality, as the state question’s proposed ballot title calls specifically for the $4,000 pay hike. That amount could’ve been funded by the $330 million that was originally expected to be raised by increasing the gross production rate from 2 to 7 percent. Thompson said the $4,000 pay raise wouldn’t be fully funded should voters approve the state question. Adding another $4,000 to teachers’ pay would cost more than when the ballot measure was proposed because the Legislature already raised the gross production tax rate from 2 to 5 percent. SQ 795 would add another two percentage points while earmarking hundreds of millions of dollars. Thompson said his group is also looking at whether the $3 million or more its members planned to raise for the effort could be put to better use at this point. He said that money, for example, could be critical if his group were to start a political action committee to elect pro-education candidates or help defeat the veto referendum Oklahoma Taxpayers Unite! is spearheading. A decision is expected shortly. The secretary of state soon will specify the 90-day circulation period in which the group would need to collect 123,725 signatures from registered voters.